A dental laboratory and its technicians are a vital part of a patient’s dental care. Our onsite laboratory works directly with our dentists by following their detailed instructions. Our laboratory uses impressions and molds of the patient’s teeth or oral soft tissues, to create dentures, partial dentures and implants, bridges, crowns, veneers and orthodontic appliances to help straighten and protect teeth and to ensure a beautiful smile. Many dental practices use offsite laboratories where they send your prescription but there are many benefits to our onsite laboratory at Saipan Seventh-day Adventist Clinic. Quality control – Having the laboratory onsite allows your Dentist to have better control of your treatment from start to finish. They can ensure the excellence of the quality of the product and service that the lab provides. It also allows our lab technicians to provide a customized service as they can assess your needs together with your dentist at your initial appointment. They can make precise molds of your teeth there and then and the lab has the advanced technology that allows them to see the shape, formation and exact color of your teeth at the early stages. Our technicians can easily locate any problems that will involve their expertise and work on them with your dentist from the start. This minimizes the risks of any errors or mistakes, which can cost you time and money. Aesthetics – Your teeth are a vital part of your appearance and a beautiful smile is important for your confidence. The technicians in our laboratory, who craft your crown, veneers, implants or dentures, have the skills to ensure that you get the best dental restoration. 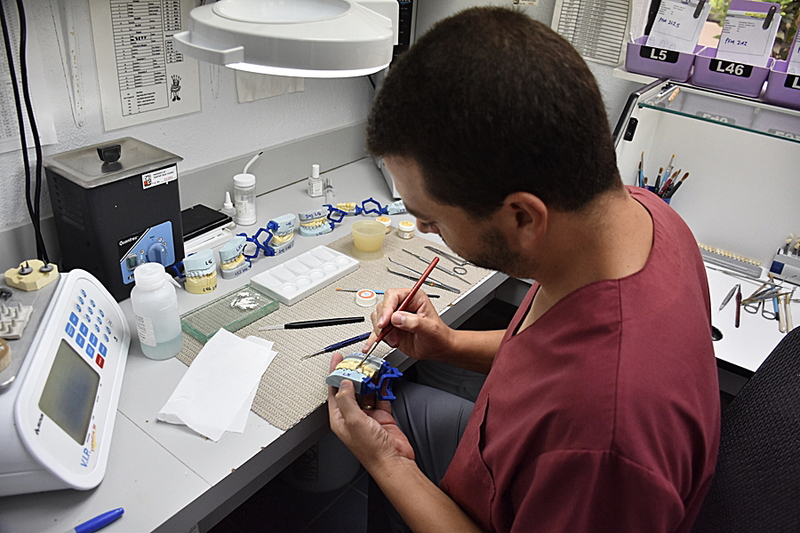 Having our lab onsite means your technician can meet you face to face and ensure he or she makes the right choice of color, shape, direction and size for your restoration so it matches your facial features, skin color and the rest of your teeth. Precise results – Because our technicians are onsite they can make an exact match with the rest of your teeth. This will ensure a more natural result for your restoration and you will feel more confident that you look your best. Convenience – If a dentist does not have lab technicians onsite, you will often have to make multiple trips for fittings so they can be sent to an offsite laboratory for adjustments each time. You may also have the inconvenience of having to wear a temporary restoration until your final product has been made and fitted. With our onsite lab you may only have to wait one day for your treatment to be completed. The technician can take molds and make fittings in one appointment. When your treatment is underway the technician is on hand to check the shape, color and fit. This ensures optimal cosmetic appearance and functional results. It also reduces the need for multiple appointments because the changes can be made onsite. Fast Completion – With our onsite lab, custom restoration treatments can be completed quickly and efficiently. Your fitting will often only take one appointment, as the lab can be quick and efficient with any adjustments or modifications. This saves your precious time and reduces the stress of multiple appointments.